Promotion of the use of the bus as a means of transport offering efficient service, and, at the same time, with a minimum impact on the environment as opposed to that of private vehicles. With this aim in mind, in the last decade, Dbus has added buses with advanced technology in pollution and fuel consumption reduction to his fleet. The company’s diesel buses follow a strict maintenance regime, ensuring low emissions and guaranteeing optimised fuel efficiency. In addition, over 83% of the vehicles are above the Euro 3 emission limit, thus guaranteeing cleaner air in the city. The latest addition to the Dbus diesel fleet were the four 12m MAN Lion’s City buses with Euro 6c technology purchased in December 2017, the most advanced as regards emissions levels. The Dbus fleet includes five MAN Lion’s City Hybrid, an efficient bus with fuel consumption reduction of 30% in relation to diesel buses. Dbus also has another 19 hybrid buses, SOLARIS Urbino Hybrid 12, creating an increasingly cleaner and more efficient fleet. Since July 2014 and July 2016, three 100% electric buses manufactured by Irizar have been running on Dbus routes. The electric bus is a silent bus with 0 emissions into the atmosphere, which goes to show the company’s commitment to sustainability and the quality of life of the people of the city. Likewise, from June 2018 to January 2019 Dbus tested in a pilot project its first 100% articulated electric bus, manufactured by Irizar Group. The bus needed night charge in the depot, but also required a 5-6 minutes charge during the route. This charge took place in Miramon bus stop, which is 28-Amara-Ospitaleak line final stop. The bus has a pantograph that unfolds from the roof of the bus and connects to the loading post to receive a 500kW power charge. The actual efficiency of each bus can be improved and strengthened thanks to complementary technologies that allow for the optimised performance of the vehicle and, consequently, help reduce their impact on the environment. 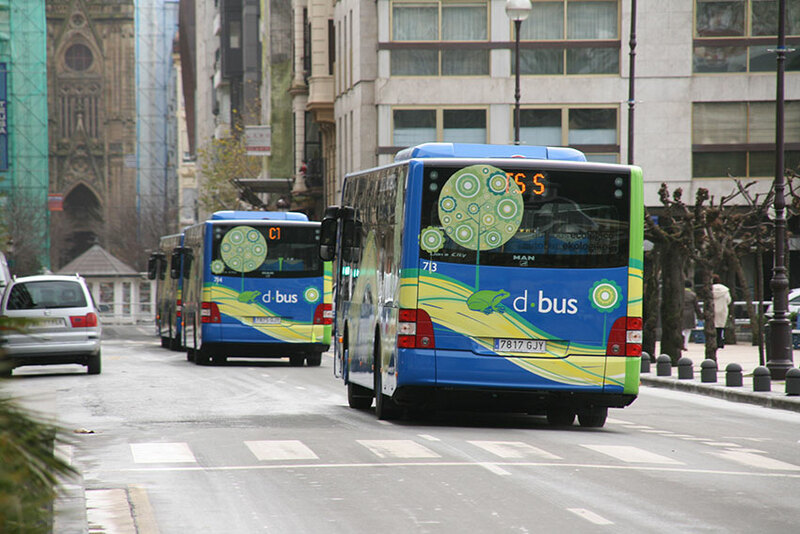 Dbus has installed an innovative system for improving the energy efficiency of its fleet and the punctuality of its service. 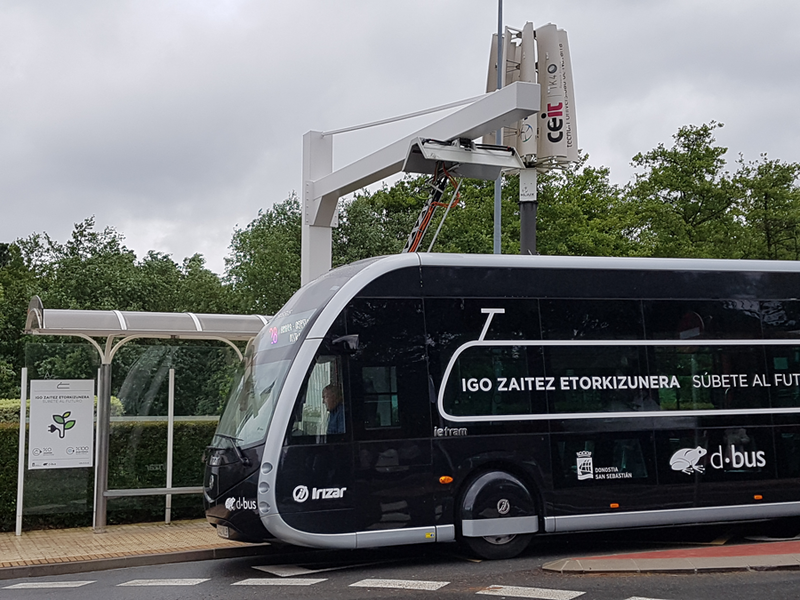 The new system deployed in San Sebastian, called EKObus, is the first to be installed in the world. It is a system that helps reduce fuel consumption and pollutant gas emissions into the atmosphere. Thanks to the instructions displaying as icons, the system tells the driver the proper way to drive at each moment, thus leading to better driving, fuel saving and fewer breakdowns. The system for improving punctuality helps maintain the required distance between buses on the same route, so that the frequency laid down for said route is fully observed. By means of a system ressembling a traffic light, the driver is told to slow down or go faster, is indicated the exact time to stop in order to maintain the frequency , as well as the exact time to leave the stop. Dbus’ most popular routes, route 5 and 28, use the BRT system, which is a top of the range bus system based on rapid, comfortable and efficient transit, with the aid of special traffic lanes giving priority to buses and excellent service to users. •Low investment costs and maintenance with respecdt to rail transport means requiring major work on infrastructure. In addition, BRT systems help improve certain aspects of conventional systems in buses, by raising the vehicle’s capacity, improving commercial speed with the aid of traffic light priority, protecting the reserved lane, improving accessibility at stops, reducing pollutant emissions and improving the image of the vehicles and the service. Quality public transport must guarantee its use by everybody, whatever their condition. That is why 100% of the Dbus fleet currently has an access ramp for wheelchair bound people, a central platform for wheelchairs and children’s pushchairs, and seats reserved for people with reduced mobility. As well as technology for boarding and disembarking the bus, Dbus has audio systems installed for the blind and people with reduced vision to facilitate access to public transport for people with sight deficiency. The audio information system is made up of three systems: on the information panels on the walls, announcing the arrival of the bus, on the outside of the bus indicating the route number and destination of the vehicle, and inside the bus, indicating the next stop. The audio service is activated by a remote control available to the visually impaired, the one used to activate sound at traffic lights. This system adds to the accessibility and comfort of Dbus services, so that everyone can travel by Dbus unhindered. 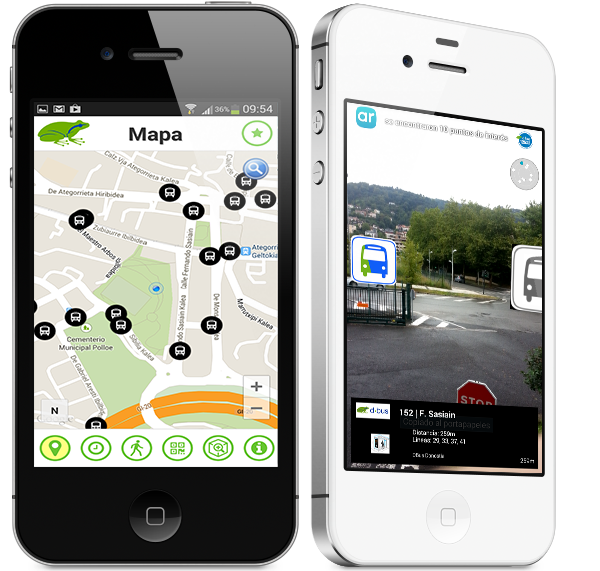 New technologies provide users with real time information on their route, how to get to a particular part of the city and plan their trip without problems. •Website with all the information on numbers, schedules, and routes, and a route planning tool. •Application for Android and iOS mobile phones, to check the arrival time of the bus, and schedules and to plan a trip at any time or place. •Platforms in most popular social networks, enabling immediate communication and direct interaction with users. •Visual information system on board the buses, by means of TFT screens offering real time information on the bus route, next stops, information on Dbus routes as well as leisure and entertainment content. In addition to the information systems keeping users informed of their bus route 24 hours a day, Dbus offers companies and independent developers the opportunity to access their Open Data platform, in order to develop their own applications and functions to improve public transport and help users avail of the same for travelling around the city. On 11th August 2017, Dbus launched a pilot project to enable users to pay for their journeys with contactless cards. It was initially only available on lines 16 Igeldo and 45 Estaciones Renfe-Bus Geltokiak – Antiguo – Aiete. On December 2018 Dbus signed with Kutxabank a contract that will allow extending the contactless bank card payment method to the whole fleet by summer of 2019. All cards currently used to pay your fare on Dbus are contact free. You just need to bring the card close to the validating machine, without the need to insert it in the machine. This system helps speed up the boarding process, preventing the formation of queues and giving more autonomy to passengers. In addition, contact free cards carry progressive discounts for use and profile type, so the more often public transport is used, the greater the discounts. 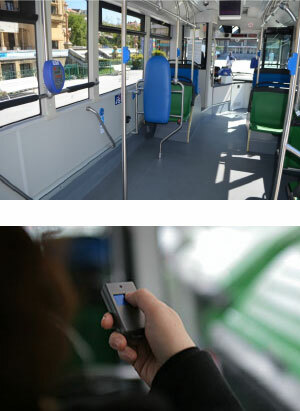 Dbus has recently added the NFC-enabled mobile phone system to its payment means. This means that users of public transport can pay their fare with their mobile phone. Thanks to this technology, the mobile phone emulates a transport card, thus making it easier to recharge the card and pay the fare, as it is all done directly with the phone. Payment with NFC-enabled mobile phones is currently at the trial stage, and it is hoped it will be applied to all users in the future. 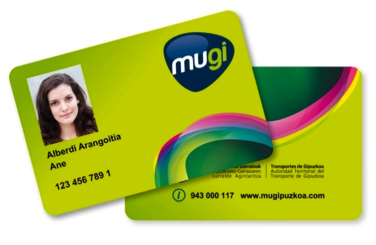 Thanks to the integration of fares and payment methods of the public transport operators in Gipuzkoa, users can now travel using the same card in all of the territory’s public transport means. 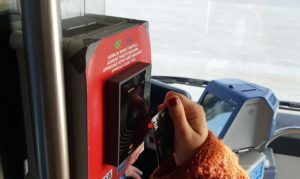 A user travelling by Dbus in San Sebastian can pay their fare using the same card to travel to another town while accumulating the corresponding discounts. Transfers are also more simple, as changes with the same operator are free of charge, and there is a considerable discount when they are made between different operators. The optimisation of existing resources not only implies maximum performance, but also a more efficient and reliable service. At Dbus we work with the most advanced programs to manage buses, schedules and personnel. The system allows for the optimisation of resources and guarantees the service and punctuality of the buses, by means of the constant monitoring of the buses running. By means of this system, Dbus experts can provide an immediate response to traffic incidents, incidents relating to the buses themselves, as well as minimise the delays caused by said incidents, and offer people the best service. Dbus has advanced software to make the best possible use of the bus fleet and available personnel, and thus reduce to a minimum the downtime of each bus and each driver during their working day. Each route’s schedule is planned using the same optimisation concept, as waiting times at stops are lowered and the service offered provides greater cover. San Sebastian has several sections of bus lane throughout the city. San Sebastian currently has 12 km of bus lane, an exclusive zone for buses and taxis, making sure the buses run fluidly even when there is heavy traffic. Nowadays, 21% of the kilometres covered by people using Dbus are on bus lanes, thus reducing the time of the journey and improving quality. The punctuality of public transport is key to offering an efficient service to citizens. To this end, Dbus has traffic light priority systems consisting in the automatic adaptation of the traffic lights to waiting time requirements of the buses at cross roads, thus resulting in a reduction in waiting time. Currently, Dbus buses can request priority at 82 intersections throughout the city as well as avail of an exclusive traffic light between San Martín and Fuenterrabía streets. 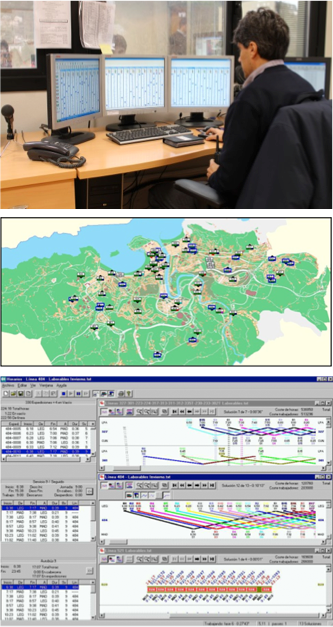 The Dbus control centre is in charge of coordinating the proper functioning of all the routes and is likewise in constant communication with San Sebastian’s municipal police and traffic wardens. 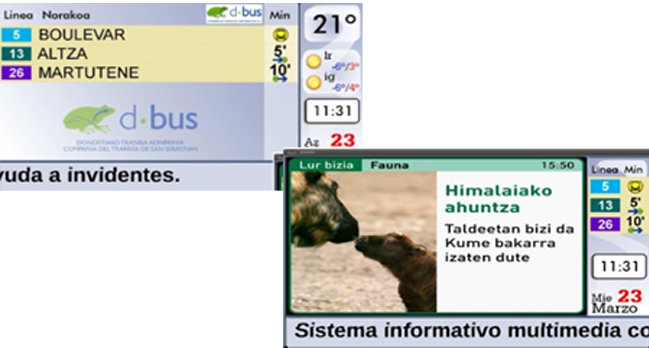 In the event of any incident, Dbus inspectors can use a computer application to contact the municipal police and request the authorities to intervene. Reducing bus boarding time and preventing the formation of queues is key to avoiding delays in the service. To this end, Dbus has installed fast reading validating machines in all of its buses. Validating machines have also been installed near the central door for people with reduced mobility and people with children’s pushchairs, thus making it unnecessary for them to go to the driver to pay their fare. Currently, less than 10.7% of the trips made on Dbus are paid in cash. The introduction of contact free intelligent tickets and the new payment systems such as payment using NFC-enabled mobile phones speed up and make fare payment easier for users. Since 2010, 100% of the Dbus fleet has surveillance cameras on board. Surveillance guarantees the safety of those using the bus and the drivers themselves in the event of any unusual circumstance. 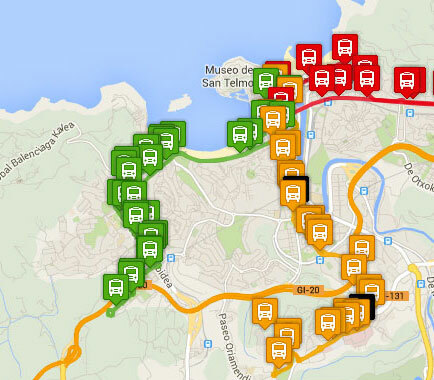 The anti-bunching system is part of the EKO-bus system for improving the efficiency and punctuality of the service. 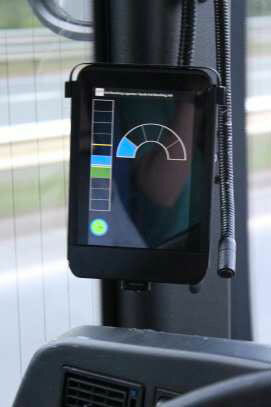 It is supported by a tablet located near the driver’s position. It warns the driver when the distance between buses on the same route is not the proper one to maintain punctuality, and emits signals and recommendations to prevent this from happening.